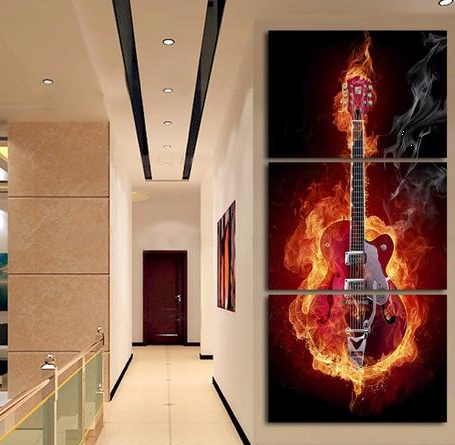 One of the main reasons people buy multi panel wall art is to add a feature to a large den or living room wall. They have a great visual impact on most walls where hung, but can be tricky to put up just so. Let’s look at what you might hang on your wall and then, how to go about it. Multi panel wall art can appear to be like a window into another world, with the gaps between the canvases resembling window frames. This is why people frequently purchase landscape images. You may love the Rockies or a particular beach scene at sunset. The canvases can let you imagine you are looking through a window to those striking scenes. Other people may have icons they wish to see every day – perhaps a certain muscle car or an image from the Bible. Such images can give you strength on days when you can’t see the wood from the trees. Another thing to consider is on what medium you want the images? 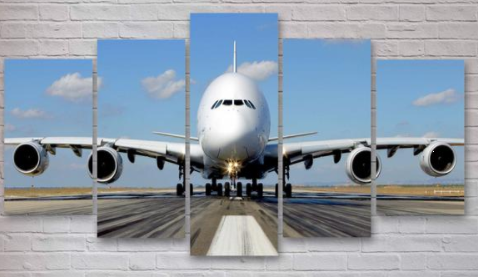 While most multi panel wall art is on canvas (and is very light relative to the eventual size) you can choose from wood or metal images. Wood is one of the most individual print mediums of all as every panel will be subtly different with its grain and texture. Metal panels are noted for their patina that adds a certain industrial look to your imagery. Once your delivery has arrived, you then need to hang it. This isn’t as easy as a single panel image which largely just needs to be straight and level once up. You will need two people to measure and hang the frames. You should have gaps of 2-3 inches between the panels depending on the overall size. If there is a real flow to the image you have chosen – perhaps a mountain valley with a river flowing between – you can get away with a larger gap than something like a Ferrari muscle car. The artwork or photography should be at eye level. This helps people think they are looking through a window. 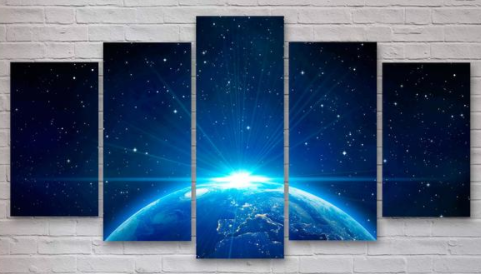 How are you going to hang the multi panel wall art? If it is canvas you should be able to get away with a simple set of picture hooks as you may hang a normal picture. If it is a heavy piece of wood or metal, then consider stronger fixings such as hooks screwed via rawlplugs into the wall. Measure and locate the exact positions you need to hang the canvases. Once you think you have it right, measure it once or twice more until you have two measurements exactly the same – you’d be surprised as to how even the best get their measurements wrong! Once you are sure you have it right, hang the imagery. This could take 20 minutes but you will be rewarded with a stunning feature for an otherwise empty wall.